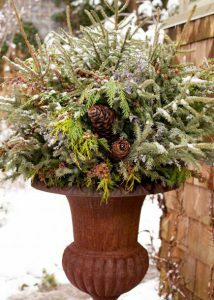 Creating eye-catching winter containers can be an inexpensive and easy way to dress up a home’s entrance while waiting for Spring to return. Here are a few tips when creating your holiday containers. Containers do not have to be complicated to be beautiful. To safeguard against wind, ice and snow insert plastic liners that are roughly 1″ smaller than the container you are working with, this will reduce the risk of cracking as temperatures fluctuate. For an arrangement that is both fragrant and tactile be sure to mix live and dried materials. 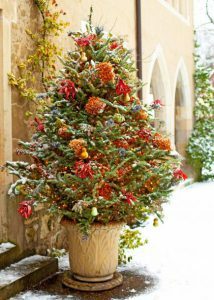 Pack the pot tightly so you can remove branches past their prime and still have a full arrangement all season. A trick to keep berries on the branches; spray with a wax spray which can be found at most local craft stores. Using sticks from a variety of plants will add height, colour and texture to any outdoor pot. 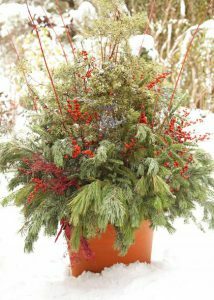 A holiday container can add a wonderfully personal touch to any space while enhancing your winter landscape.